I had the opportunity to visit the home of an award winning local architect recently. Light filled every room from large banks of windows, attention to detail was obvious at every turn with space being maximized in such a way as only an experienced designer knows how and the selection of finishes was of the highest quality. The overall effect was contemporary without being contrived and luxurious without being ostentatious. Of course I immediately looked through the windows to the garden! It would be fair to say that the homeowner is only just now turning his attention to the landscape and that its potential is waiting to be realized. What struck me was the solid bank of evergreens along the perimeter backed by the towering Douglas fir trees, ubiquitous in the Pacific Northwest. Certainly there was a variety of textures and shapes, the more columnar arborvitae standing in contrast to large, mounding Rhododendrons, but the overall effect was of a long wall of mid green. It cried out for something to be showcased in front and my first thought was to suggest a stand of red or yellow twig shrub dogwoods (Cornus sp.) since their bright winter stems would glow in the winter sunshine and be shown off to advantage against the homogenous background. That observation led me to think about silhouettes and how we could use them to add another dimension to our gardens. Subconsciously I must have been drawn to them for some time as I have taken many photographs of grasses and foliage backlit in such a way as to throw them into stark relief. I also love an image I captured at dusk with the moon rising, throwing a silvery light onto our lifeless big leaf maple (Acer macrophyllum). When seen this way the focus is on the structure; an important feature of the winter garden and one which is often forgotten as we set about selecting conifers and broadleaved evergreens to provide interest. 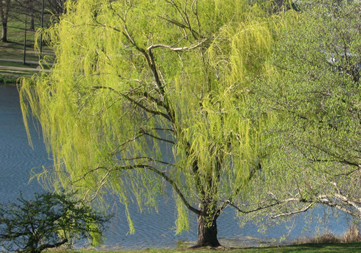 One day our 'Niobe' weeping willow will look this good! The branching structure of deciduous trees only becomes apparent when the leaves have fallen, revealing the intricate lacework previously hidden from view. To see this to advantage the backdrop needs to be clean and uncluttered, such as against a clear sky. This is especially important for weeping trees where the form is as important an element as the branching pattern itself. Weeping silver leaf pear (Pyrus salicifolia ‘pendula’), cherry (Prunus sp. ), and European birch (Betula pendula) are a just a few of the possibilities offering four season focal points in the garden. They lend a grace to the landscape that few other plants can. Weeping willows (Salix babylonica and hybrids) can be seen swaying gently in the breeze and the form ‘Niobe’ (Salix alba ‘Tristis’) is especially eye catching with its bright yellow bark and branches. Ours marks the entrance to a meadow and although still young (and frequently nibbled by deer) gives us a glimpse of the mature silhouette to come. Likewise tightly columnar trees showcase their sentry-like form when viewed against a solid green backdrop or an unobstructed view. Rows of Lombardy poplar trees (Populus nigra ‘Italica’) have been used for centuries as windbreaks on farms and other exposed areas. In winter their skeletonized beauty is striking in the open landscape. For the smaller garden, columnar forms of liquidambar (Liquidambar styraciflua) and Persian ironwood (Parrotia persica) are examples of trees whose silhouette becomes a valuable winter design feature, also offering the advantage of interesting bark. There are several deciduous trees which exhibit a tiered branching pattern including several Japanese maples e.g. Inaba Shidare cutleaf Japanese Maple (Acer palmatum 'Inaba Shidare') and the wedding cake tree (Cornus controversa). Stunning in spring and summer these bring new life to the winter garden with their strong horizontal planes. When we first moved to this property there was an area of dense cottonwoods and alder (interspersed with beer cans, lumps of concrete and discarded plant pots!) Yet as we cleared the area to make way for a woodland garden we uncovered an overgrown seasonal stream – and a stand of curly willow (Salix matsudana 'Tortuosa') which were thriving in the wet soil. Their twisted branches had been completely obscured by the surrounding trees, their winter value being lost in the thicket. Granted we thinned them out a bit but the remaining shrubs give me plenty of material for flower arranging as well as winter interest in that part of the garden. Corkscrew hazel, also known as Harry Lauder’s walking stick (Corylus avellana ‘Contorta’)has an even more twisted structure with mature specimens exhibiting fascinating gnarled branches which are especially striking when dusted with snow. Yellow catkins dangle from these bare branches in February giving the effect of an out of season holiday display. The twisted foliage is not particularly attractive to my eyes although many find it pleasing. I use it in designs purely for winter interest. a winter sky and conifers. Stunning. A silhouette by definition is something lit in such a way as to appear dark, but surrounded by light. Yet in the garden this can be reversed with brighter, lighter colors being set against a dark background, such as my initial suggestion for colorful dogwoods stems against an evergreen hedge. 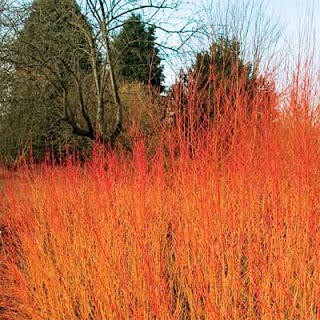 Other varieties include ‘Arctic fire’ (Cornus sericea) and ‘Midwinter fire’ (Cornus sanguinea) which have stems in fiery shades of red, orange and yellow. For something a little larger the vine maple (Acer circinatum) variety ’Pacific fire’ has pinkish red bark making it stand out within a group of other less significant plantings. 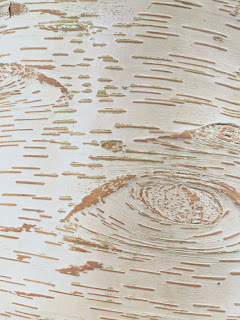 Even more striking in this regard is the white Himalayan birch (Betula utilis jacquemontii) , another four season tree providing bright green foliage which whispers in the slightest breeze, yellow fall color and pristine white bark throughout the winter. Where space is available a group of these is especially effective or for smaller gardens a single multi-trunked specimen offers a similar effect. 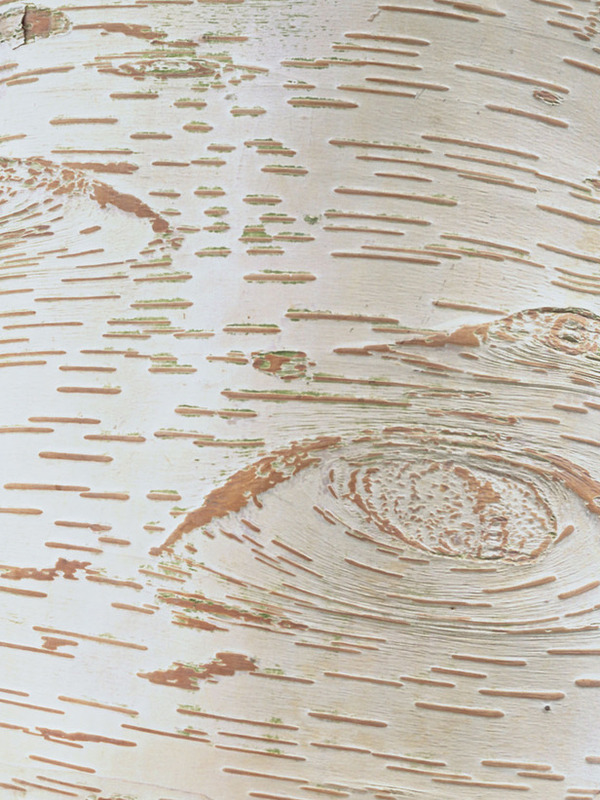 The river birch (Betula nigra) may be a better choice where birch borer infestations have become prevalent. These have peeling, salmon colored bark, with the variety ‘Heritage’ being the most ornamental. Like all birch, these tolerate wet soils and look perfectly at home adjacent to water features. 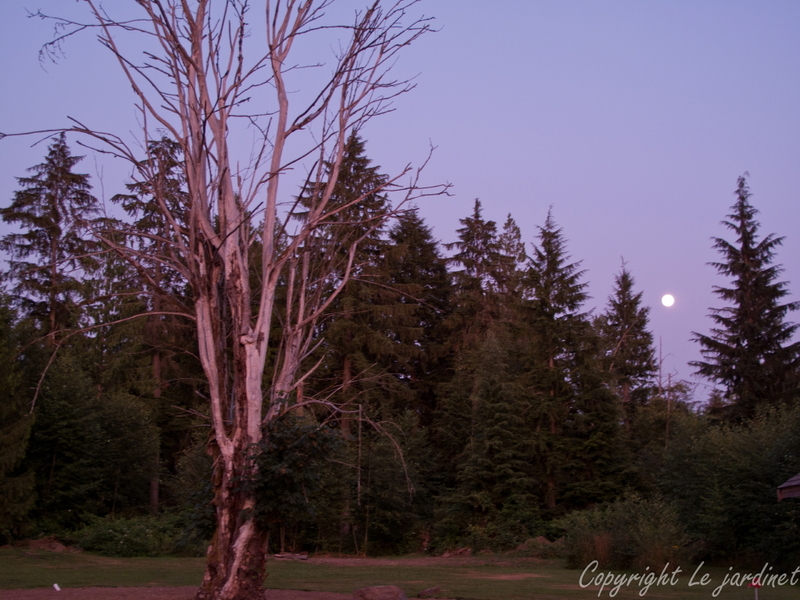 Landscape lighting can add drama to such a scene when sculptural trees are lit from below. Those with colored bark such as the coral bark maple (Acer palmatum ‘Sango-kaku’) look wonderful when highlighted in this way. border, perfectly framing our view of the winter landscape. 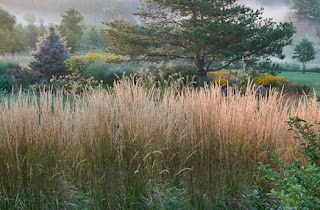 On a smaller scale grasses and seed heads, a prominent feature of the fall garden can provide silhouettes. 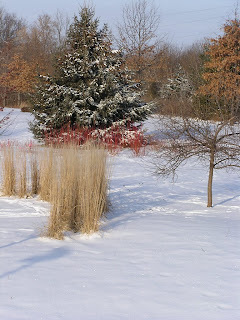 ‘Karl Foerster’ feather reed grass (Calamagrostis acutifolia) is a strongly vertical grass which stands soldier-like throughout the winter, even after a snowfall. When planted along a perimeter or massed in a border these are eye catching winter focal points until trimmed back in early spring. 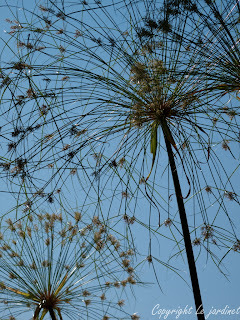 Seed heads are as numerous as your patience! I have to admit that I prefer not to keep seed heads on sedums, black eyed Susan’s (Rudbeckia sp.) or coneflowers (Echinacea sp.) when planted close to the house. Attractive they may be, and a valuable winter food source for birds, but their attractiveness is on the brown, bedraggled somewhat mushy side for my taste! In amongst shrubs and a little distance away I am happy to leave them alone, since they are not in prime view. A good compromise for the more fastidious gardener perhaps. to create a winter wonderland. So although winter gardens rely heavily on a combination evergreens, berries and cold hardy flowers consider adding a further layer of interest by adding some of these suggestions. Don’t you just love it when I give you an excuse to go shopping? Many of these plants are on sale in winter too! Karen, it's too true that we don't think enough about winter when we're in a planting frenzy in spring and are desperate for flowers. 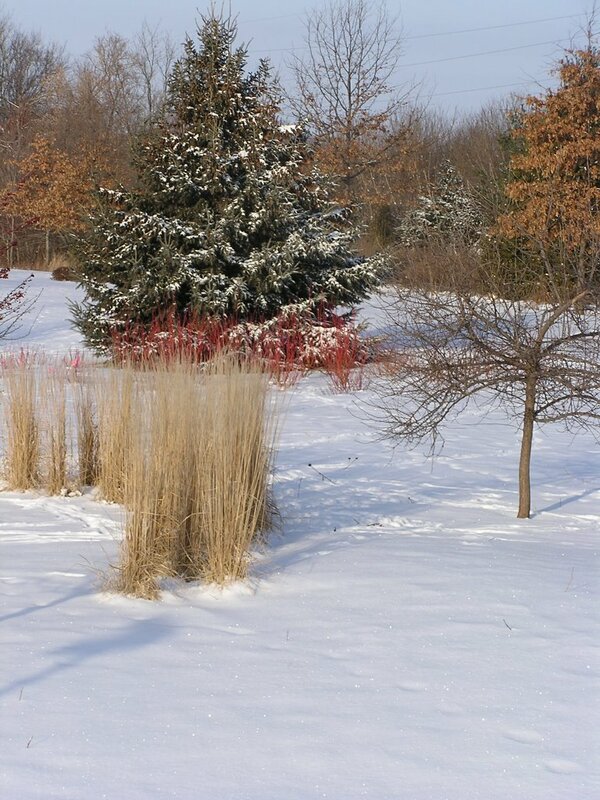 (If we did more planting in winter, our priorities would be a lot different!) Since I have such a small garden I've been working more to include winter interest. I think there's some good backbone beginning to happen, but the walls kind of stymie me. Other than vines (which are taking a while to get started) do you have any suggestions off the cuff? When I lived in Vermont I used to drive for miles to see a beautiful, old plane tree that grew on a hillside against open sky--those beautiful white limbs were stunning in winter! Stacy, how tall are your walls and what are they made of? Are they in sun or shade? I can think of plenty of ideas but those answers would enable me to narrow it down. Feel free to email me karen@lejardinetdesigns.com or post here. I love our cornus and betula utilis jaquemontii at this time if year. It's a shame our grasses are getting shredded and are not going to last the winter. Your post is food for thought, Karen. Janet - we have very similar tastes! Is it just this years weather that has shredded your grasses or is this always the case? What about stiffer ones like blue oat grass? Our winter interest is the two mountain ash tree - which are briefly leafless against a deep blue winter sky. But for the rest of our garden, winter means a sigh of relief. Cool rain green grows the garden!! Elephant's Eye - my husband used to live on 'Ash Farm', so named for the mountain ash trees. beautiful structure. I can enjoy the greening of a garden, but do you have the months of grey skies that accompany it? That's what gets me down. 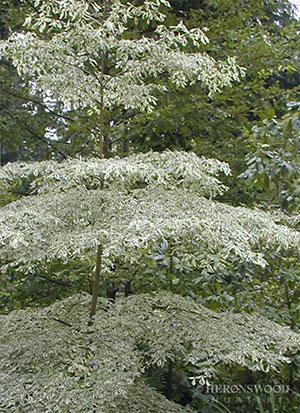 I had an opportunity to purchase a Cornus controversa several years ago. I thought it was too expensive. Now I see what I am missing! Actually, I am drooling over several plants you featured here. You have given some excellent garden design, tips too! I enjoyed this post. Perhaps because I like lines and drawings, I find my eye naturally seeks out silhouettes. There are lots of great ideas and much to think about here. I especially like the idea of using lighting to accentuate a silhouette. I am glad that you focused on shape and bark color as well. In past years, I have always cut down my brown-eyed susans and sedums. This year I left many of them. I see a whimsical beauty in their silhouettes. I like the way snow catches on the flat tops of the sedums and makes little hats for the brown-eyed susans. 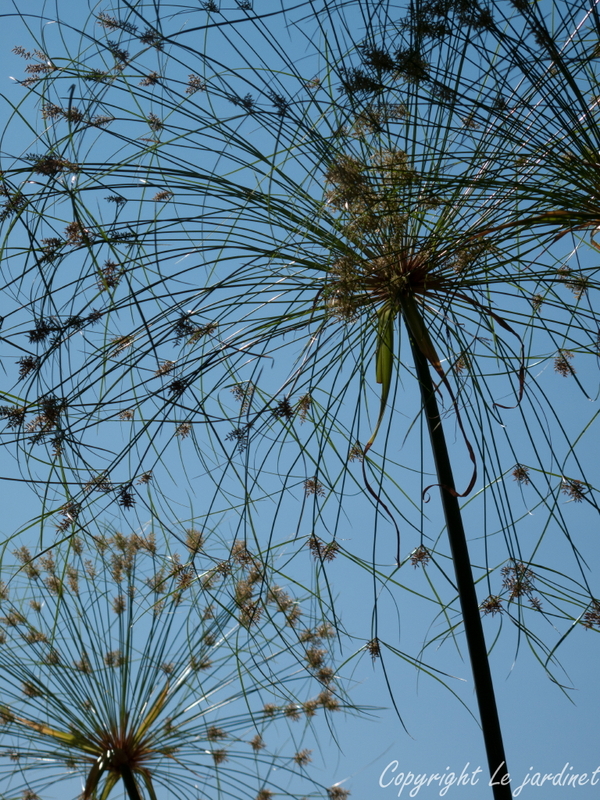 I also appreciate their small scale in comparison with the garden's other more grand and tall silhouettes. Jennifer, I like your thoughts observation scale - how the smaller perennials provide contrast to larger trees and shrubs. Good point - thank you! Deb - how sad! It would have looked spectacular in your woodland garden as an understory to some of the larger maples. I'm so glad you enjoy my design ideas - I love putting plants together to showcase each off to best effect. Just can't help myself! Fresh Inspiration for the New Year.